Much like Winston Churchill’s comment about Russia being “a riddle wrapped in a mystery inside an enigma,” the enigma of just what happened to Subhash Chandra Bose, one of India’s most iconic freedom fighters popularly known as ‘Netaji’(the leader), continues. An answer could emerge now as the state government of West Bengal prepares to open files in its possession to the public. Classified files from Ukraine, about intelligence agencies during the Soviet era, will also open to the public soon. A mystery which has endured since India’s independence in 1947 could be resolved after 70 years, or it could not, and could affect India’s relations with Russia. The Indian Prime Minister's Office told the Central Information Commission earlier this month that it could not declassify files related to Subhash Chandra Bose as it would “adversely affect relations” with foreign countries. The government also informed Parliament that there are 87 files which cannot be brought to public domain owing to their sensitive nature and “not desirable from the point of view of India’s relations with other countries”. The countries in question are Russia and Britain, a government spokesman confirmed to RIR. Mamata Banerjee, Chief Minister of West Bengal state, however, announced that her government will declassify 64 files on Bose which are now with the state’s home (interior) department and display them at the Kolkata police museum on Friday, 18 September. This announcement has reopened the mystery surrounding the fate of Bose, who was supposed to have died on August 18, 1945. Bose, a former member of the Indian Congress party, left the party and India in 1940 to seek assistance from his “enemy’s enemy,” in Germany and Italy and then Japan. 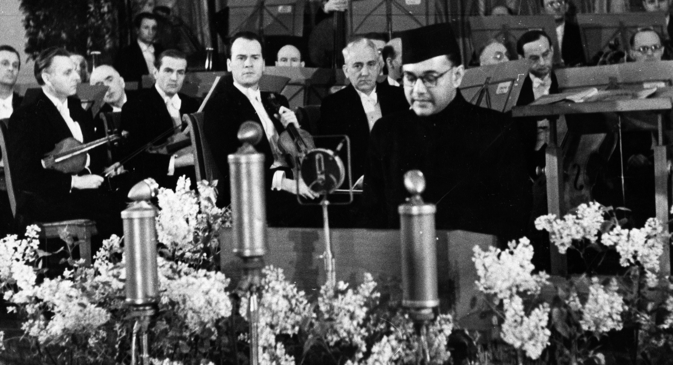 His ‘enemy’ was Britain so when Britain declared war against Nazi Germany in 1939, Bose saw a chance to liberate India by aligning with the ‘Axis’ powers, Germany, Italy and Japan. After forming the Indian National Army, Bose tried to use military means to liberate India, with the help of the Japanese. When Japan lost the war, Bose tried to leave Formosa (now Taiwan) and flee to Manchuria and on to Russia to seek assistance. Reports suggest that he died in a plane crash during take-off from Formosa (now Taiwan), on august 18, 1945. Some ashes, supposedly belonging to Bose, are preserved in a shrine at the Renkoji Temple in Tokyo. Many Indians, however, believe Bose did not die then, but only faked his disappearance. His plan was to move to Russia (which had taken over Manchuria) and seek assistance from the Soviet government, to oust the British from India. "According to the papers that exist with us, Bose had faked his death and escaped to Manchuria in China, which was then under Russian occupation, hoping Russia would look after him. But Stalin put him in a jail in Siberia. Somewhere around 1953, he hanged or suffocated Bose to death," said Subramaniam Swamy, a leader with the ruling BJP. Swamy claims India’s first Prime Minister, Jawaharlal Nehru, was aware that Bose was held captive in Yakutsk Prison in Siberia. Meanwhile, amid the growing controversy in India over declassified documents on Bose, Ukraine said it will declassify over 800, 000 ‘top secret’ files of Russian spy agencies of the Soviet era, including the KGB, SMERSH and GRU, and make them available to the public, Indian media reported earlier this year. Among the files dated between 1917 and 1991 are said to be intelligence despatches of Siberian gulags (Russian camp for political prisoners), where Bose was suspected to have been imprisoned along with prisoners of war and political dissidents. Kuslov, an ex-Soviet agent, who apparently trained Indians in 1934 and later served a few years in a Siberian gulag, had allegedly confirmed that Bose was kept as a prisoner in Cell No. 45 in Yakutsk prison. Kuslov, who knew Bose, was a Soviet agent in India in the 1930s and had meetings with Bose in Kolkata, reports in the Indian media claimed. Another spy and prisoner in Siberia, Karl Leonhard, had allegedly admitted that Bose was one of the prisoners. But the then government headed by Jawaharlal Nehru had rubbished such claims terming it American propaganda. The decision to declassify the top secret files of State Security (KGB), Main Intelligence Directorate (GRU), CHEKA, Prosecution of USSR, NKVD, SMERSH and Ministry of State Security (MGB) was taken by the Ukraine Parliament in April. GRU was founded as ‘Registration Directorate’ in 1918 and later in 1942 it was renamed GRU. SMERSH was founded by Stalin in 1943. The KGB was born in March 1954 as Committee for State Security. After Ukraine’s independence in 1991, these files were kept in the custody of its security service. The Ukraine government is planning an Internet portal to make the records available online, by the end of 2015. According to archival materials on the gulags, several camps were erected in Yakutsk on river Lena. Prisoners were employed in building new shafts for coal mines, roads, dams and so on. Each camp had 500-1,000 prisoners, many of whom died constructing roads in the coldest place on earth. Declassifying the Indian government’s files, 60 in the custody of the Prime Minister’s office and 27 with the Ministry of External Affairs, from the period between 1940 and 1960, could help resolve the enduring mystery of what actually happened to one of India’s great patriots. The Indian government has now formed an inter-ministerial committee to review its Official Secrets Act in context of demands to declassify files related to Bose's death or disappearance. Prime Minister Modi met with members of the extended Bose family and said he would try to resolve the issue. Sugato Bose, a grand-nephew of 'Netaji' and now a Member of the Indian Parliament, said "it is rubbish" to suggest that relations with any countries would be affected if the files are declassified. The Bose family is divided about raking up the issue of his death. Sugato believes that 'Netaji' Bose died in 1945. He feels releasing all the files to the public would "once and for always" stop speculation. Another branch of the family feels that he escaped to Russia and there was a cover-up by Nehru and the Congress about the fate of a possible rival.